‍Foodmate.com is the No.1 food b2b E-marketplace all over the world, offers comprehensive e-commerce solution to both Global Food Buyers and Suppliers and help them establish good business relationship through our marketplace (b2b website). 1. 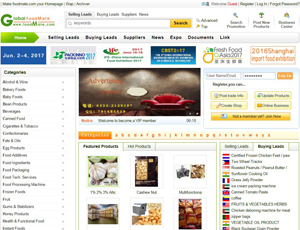 Access to the largest directory of global food suppliers, especially China Food Suppliers. 2. Free Sourcing and Business Matching, assist you to find the matched food suppliers. 3. Post your Buy Offers to have only credible suppliers (Premium Memberships) to quote you. 4. Search Engine-find products and suppliers efficiently through "Product Search" or "Supplier Search"
About Foodmate.com - B2B Food Marketplace for Suppliers and Manufacturers's recommend,only on behalf of the views and opinions about B2B Directory, if you have any suggestions , please feel free to contact with us, we will amend and correct them in the first time according your suggestions. More better B2B Websites recomend, Please click here.